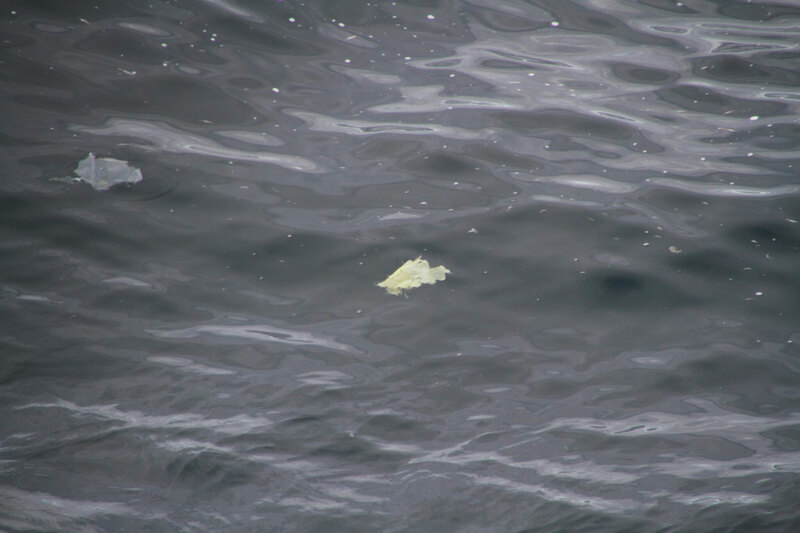 During previous TUNU expeditions, researchers found floating plastic debris northeast of Greenland. Photo: Peter Rask Møller / Natural History Museum of Denmark. Researchers from UiT The Arctic University of Norway visited the waters northeast of Greenland with RV Helmer Hanssen to sample water and fish species and test for microplastics. Photo: Arve Lynghammar / UiT The Arctic University of Norway. Plastics have many advantages in our daily lives, for instance, they help us prevent food from going to waste, save energy in our homes and decrease CO2 emissions. According to Plastics Europe, global production of plastics has consistently increased and is currently at 335 million tonnes per year. However, plastic pollution is an emerging and growing threat across world oceans. Once plastics get out into the environment, they tend to break down into smaller debris also known as microplastics. Researchers from UiT The Arctic University of Norway investigated the presence of microplastics in the water and in two Arctic fish species off the coast of northeastern Greenland. Microplastics (MPs) are synthetic organic polymer particles less than 5 mm in size that may differ in shape, colour, and chemical composition. They can be categorised as primary or secondary. Primary MPs are used in specific personal care products (hand cleaners, facial cleaners and toothpaste). Secondary MPs come from larger pieces of plastic that gradually break down. About 75-90% of the plastic debris in the marine environment has been estimated to originate from land-based sources and 10-25% come from ocean-based sources. “What motivated us to investigate microplastics in Greenland is that we saw plenty of plastic debris when we went there in previous years to study arctic fish communities,” says professor Jørgen Schou Christiansen from UiT. Christiansen and colleagues have travelled regularly to Northeast Greenland since 2002 in connection with the TUNU Programme, a broad research effort to learn more about fishes and other marine fauna in the Arctic. Northeast Greenland has barely been studied, so the TUNU expeditions provide important baseline data. The researchers sampled water to study microplastics in the water column. They also wanted to see if fish ingested microplastics. The researchers picked out fish species with two different feeding strategies: the polar cod (Boreogadus saida) which feeds in open water or in areas where there is sea ice, and the bigeye sculpin (Triglops nybelini) which feeds on or near the bottom of the ocean. The polar cod is associated with sea ice that also stores a lot of microplastics, so the species could be particularly exposed to microplastics pollution. 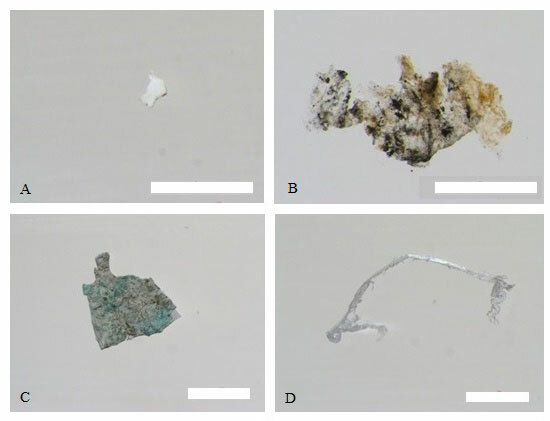 Christiansen and his colleagues found plastic debris in their water samples at a concentration of 2.4 items/m3 ±0.8 SD, which is higher than in most seas at lower latitudes. Both fish species had in fact eaten microplastics. The researchers found that 34% of the bigeye sculpins contained microplastics, while 18% of the polar cod contained microplastics. The most common microplastic the researchers found in the water column was polyethene. It is the most abundant polymer type and belongs to the largest product group of plastics. Polyethene is widely used as packaging material and is often discarded after a single use. Polyester was the plastic most frequently found in fishes. Polyester is commonly used in textiles and fishing gear and has already been documented in both water and ice in the Arctic Ocean. The difference between the species is most likely a result of feeding habits and the habitat in which they live. Microplastics seem to accumulate at the bottom of the ocean, where the bigeye sculpin feeds. As we all know, it’s not such a good idea to eat food from the floor! The dominant colour of the microplastics found in fishes was blue, similar to the colour of the zooplankton they eat. It appears likely that they mistake the plastic material for their prey. Microplastics can also be consumed indirectly, by eating prey contaminated with the plastic. The fish species that prey on zooplankton and contain microplastics can be eaten by top predators. This makes them carriers of plastics within the food chain. A major problem with microplastics is that they are small enough for a wide range of organisms to ingest them. This can create a false sense of feeling full. If the organisms then stop eating, they could miss out on nutrients that they need to survive. Ingested plastic may also injure the organisms or clog their digestive systems. Floating plastic debris could potentially also carry non-native bacteria, algae and even small animals that might threaten the biodiversity of environments they are transported to. The findings of the recently published study underscore that the Arctic is turning into a hotspot for plastic pollution, and this calls urgently for precautionary measures. Even though the Arctic currently does not have a lot of human activity, ocean currents bring in plastic litter from areas where humans have had a greater impact. In addition, sea ice is known to be a sink for microplastic accumulation. As global warming continues to contribute to melting sea ice, the amount of plastic in the waters of the Arctic Ocean is likely to increase. With the reduction in sea ice, the Arctic is also expected to see more human activity, such as tourism, shipping, and fisheries. We expect this to further exacerbate microplastic pollution in the Arctic Ocean.